…as seen by the high values of “A” (additive heritability) here from this behavioral genetic study (click image for paper). Also note the 0 effect of the shared environment (parenting and the home environment), consistent with the lack of effect of these forces on behavioral traits. EDIT, 1/14/15: [I wanted to correct the matter of the shared environment contribution to religiosity cited here. It is in fact zero, but the study originally cited here didn’t show this. Most behavioral genetic studies on religiosity do find a non-insignificant shared environment impact. However, standard twin studies confound shared environment with the effect of assortative mating. A review of behavioral genetic studies, Koenig & McGue, 2011 found that comparison of reared-apart twins with reared-together twins showed a shared environment contribution of 0 (A = 0.46-0.52, C = 0.00, E = 0.48-0.54). An extended-twin study (Zietsch et al, 2012) from Australia did find attenuated heritability and inflated shared environment thanks to assortative mating for religiosity, unfortunately, they don’t report their C value in the study. Another extended twin design, based on the Virginia 30,000 (see Eaves et al 1999) found that the reported C value on religiosity (and many other things) was entirely due to assortative mating (Coventry & Keller, 2005). This indicates that religious belief – or lack there of – is largely intractable. It is a futile effort to get people to give up religion en masse (or, for that matter, to get non-believers to believe). You may have some individual “successes”, largely because of changing the environmental context of people who already had the genetic potential for whatever belief you want to instill, but you’re not going to achieve broad change in the population. However, the “New Atheists” don’t seem to see it that way. Many of these speakers, including the likes of Richard Dawkins, or groups such as American Atheists proselytize atheism. Indeed, Dawkins, a self-described “militant atheist”, is very much an atheist evangelist. The belief that these individuals’ actions appear to be based is that by spreading atheism and getting people to give up their religious beliefs, society can be improved. As I have previous written, that is a foolhardy goal. The unsavory traits the New Atheists seek to change stem not from the religion, but from the people. Indeed, in the spirit of what HBD Chick would ask, where do religious beliefs come from? Sorry atheist zealots, you can’t get Muslims to behave like modern civilized (Northwestern European) people by getting them to give up Islam. You can’t turn the U.S. Deep South and Greater Appalachia into Yankeedom or the Midlands by getting the former two to give up fundamentalist Christianity. It’s just not going to happen. It’s not any more likely to happen than democracy bringing modernization to these groups – instead, you’re likely to end up with this. Dawkins as well has been very critical of Islam. And even he has had to contend with charges of racism and “Islamophobia” because of this. There is one key problem with this refreshingly frank criticism, however: it is predicated on the nation that these negative facts about Muslim peoples can be changed if they just no longer believed in the faith. Dawkins and others like him hope that – one day – these peoples can be reformed and will live like organized, peaceable, tolerant Westerners. He believes getting them to abandon religion is the key. Of course, strictly speaking, that would work. But Dawkins would never live to see the results. You’d need many generations of change – centuries worth – to see a difference. One of those changes would need to be putting an end to cousin marriage, which is far and away the rule in Muslim societies. You’d need to wait because the changes would need to happen on a genetic level (i.e., evolution), and you’d need a fair amount of time for these evolutionary changes to occur. As noted over at the blog Occam’s Razor, the problems with Muslims stem from their race(s), not their religion. 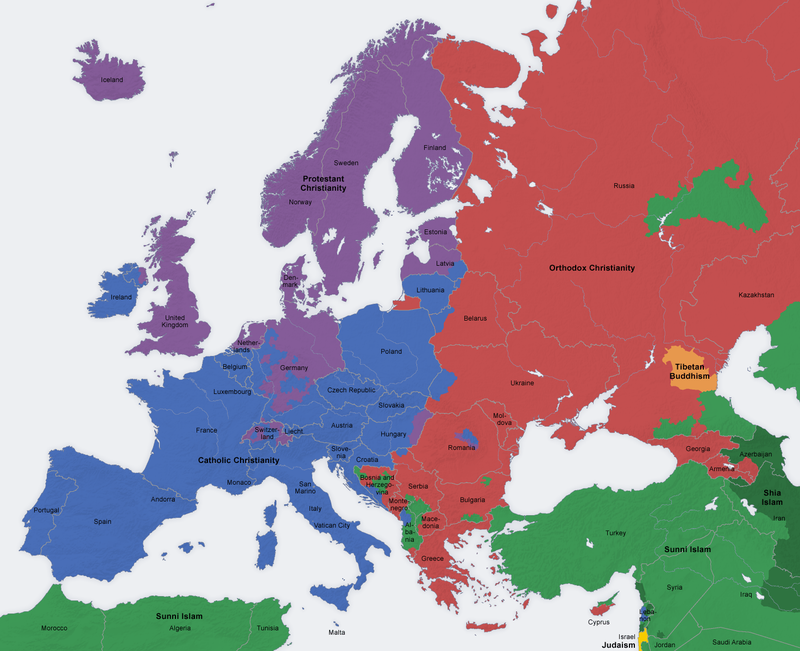 an ages old divide in europe — latins+the british isles (-the anglo-saxons, of course) versus the germans versus the slavs… this tripartite division of europe has influenced|dictated so much in european history. i mean, look at the (broadly speaking) religious divide in europe… latins+british isles=roman catholic; germans=protestant; slavs=eastern orthodox. also, latins+british isles=piigs; germans=the thrifty, competent people who might get stuck bailing-out the e.u. ; slavs=f*cked up former communist countries. Religion seems so inextricably tied to people that the New Atheists hopes seem quite futile. However, it’s worth mentioning here that while there seems to be genetic underpinnings to religion – even the particular religion one adheres to (at least on the level of ethnic groups) – for the religious there is quite a bit of flexibility in what particular beliefs one holds. Many belief systems can fit the various “god-shaped holes” in people. Indeed, today’s atheists evolved from quite theistic earlier people. We can see that all across the developed world, where previous traditional religions have given rise to de facto and nominal atheism. Of course, in many of these societies “atheism” is a bit of a stretch. Even in many of these nominally atheist societies, belief – or more accurately faith – is not absent. Secular religions have replaced spiritual ones. The belief in the supreme rational faculties and universal similarity of man that New Atheism (and for that matter, much of modern liberalism) is predicated on – essentially a watered-down blank-slatist view – is such an example. Dawkins – someone who, as a premier evolutionary biologist, should know better – seems to have such a view. Indeed, it has been suggested that Dawkins’s evangelism is a type of neo-Puritanism, in the same vein as American Yankee liberal views are. For the modern-day Puritans (who are the literal descendents of the colonial Puritans), evangelical liberal ethos have replaced the Calvinist spiritualism of their ancestors. The mental faculties have just been co-opted for something else, something that functions similarly. “God’s chosen people” have now become the enlightened cosmopolitan minds spreading the gospel of tolerance, diversity, and reverence of knowledge and learning. I went to Dawkins’s site and replied with links to my previous post on HBD and Atheism, as well as my posts on fertility and political orientation (and by extension, religiosity), as well as my post noting that all human behavioral traits are heritable. And, interestingly – and perhaps tellingly, they deleted my comment. Dawkins may be committed to a narrative, one that says that all peoples have the potential to be “uplifted” into right-thinking folks – if we just get them to abandoned their backwards superstitions (religion). Indeed, he even recently doubled down of his “We are all Africans” mantra (as if absolutely no relevant biological changes could have happened since then – as the esteemed evolutionary biologist and author of The Selfish Gene should know). Can’t have inconvenient facts about human biodiversity coming along messing that up, now can we? So, oddly, this whole exercise got me to think about a factor that could be at the root of HBD-denial: do HBD-deniers do so because they fear what are fairly rational policy implications from the biological reality? Indeed, is Dawkins himself such a man, and that’s why he sticks to the narrative (at least his version of it)? A clue that this could be the case is that many – if not all of the principled detractors who articulate objections to investigation of genetic explanations for individual and group differences always invoke the slippery slope to coercive eugenics and Nazism. This touches on a deep issue, one which, in many ways, underlies much HBD discussion: why is HBD taboo? The idea that liberals, for example, fear what others might do if biological group differences were known is nothing new; indeed, I made the very same case. But understanding a finer element would be interesting and useful; if the problem is that good liberals fear what they themselves might do with the knowledge, it may suggest another way to approach the issue. This post distorts the historical facts concerning the ethnoreligious divide in Europe, which had very little to do with the racial makeup of the residents and much more to do with the political and ideological preferences – and military fortunes – of various monarchs. If King Henry VIII could have obtained a divorce, perchance we wouldn’t be seeing the Church of England. If the Ottomans met with more success at the gates of Vienna, perhaps we would be seeing Muslim Austrians where Catholics are today. And let us not forget that Catholic France developed very differently in the post-Enlightenment Age from Catholic Spain, much of it having to do with their respective colonial fortunes. This posting overvalues race way too much as a factor. Sometimes, a particular region’s religion is far more contingent on the vagaries of fate and military conquest than this post will allow. If King Henry VIII could have obtained a divorce, perchance we wouldn’t be seeing the Church of England. Or may be there would have been another schism with the Catholic Church later. Sometimes all roads lead to the same place, especially when there are genetic reasons for such. If the Ottomans met with more success at the gates of Vienna, perhaps we would be seeing Muslim Austrians where Catholics are today. Is most of Southeastern Europe Muslim today? How different are Greeks and Turks today? For that matter, how different are Muslim Albanians from Christian Albanians? Historical accidents happen but history is a lot less random than you think. Your black and white map with the red religious borders is totally incorrect. All of Austria, not just Vienna, Burgenland, Lower Austria, and Carinthia is overwhelmingly Catholic. Only 5% of Austria is Protestant. Bavaria is overwhelmingly Catholic. The Czech Republic has more non religious people than religious ones. Catholicism still is more popular than Protestantism, in the Czech Republic, despite the fact that religion is not big there. Luxembourg is overwhelmingly Catholic. Belgium has many more Catholics than Protestants. Northern Italy is Catholic as opposed to Protestant. Lithuania is overwhelmingly Catholic as opposed to Eastern Orthodox. Latvia, and Estonia are Protestant. Albania is Muslim with a large Eastern Orthodox population. Bosnia and Herzogovina is mainly Muslim, but has large Eastern Orthodox and Catholic populations. Hungary is mainly Catholic but has a sizeable Protestant population, and a small Eastern Orthodox population. Montenegro is Eastern Orthodox as opposed to Catholic. Slovakia is Catholic as opposed to Eastern Orthodox. Kosovo is mainly Muslim but has a large Eastern Orthodox population. I am kind of surprised at your statement “being an atheist is the only natural position one can have if one is being a true scientist. ” Surely being an agnostic is the only natural position one can have if one is a true scientist. The fact that we don’t see any evidence of gods around this neck of the Universe right now is hardly proof of anything. Space is deep. I could even make a principled argument for believing that ‘many beings, indeed entire races of beings who are God-like exist somewhere in the the Universe, and for all we know, have visited the earth many times in the past…’ is the only natural position one can have if one is being a true scientist. The odds of that seem far greater than the odds that ‘human beings are the most advanced race that has ever existed in the universe…’ Because time is deep too. Of course, my definition of ‘god-like’ isn’t ‘created the universe, space, and time itself’. Its just ‘way, way, more advanced than us’. And not just technologically either. Even at our level of technology one can see that the next step up is genetic engineering. And, who knows? Maybe I’m being too conservative at ruling out some god/gods creating the universe. After all, I wouldn’t have much trouble believing that some god-like being/beings created THIS universe. I mean, really, how surprised could you be if it turned out that THIS universe is a pocket universe, and the big bang was deliberately engineered by some fantastically advanced beings in its parent universe?